A child waits as UNICEF-supported emergency humanitarian supplies are distributed in Hudaydah, Yemen in June 2018. The figures of the crisis are staggering and near-impossible to grasp: 22.2 million in need of assistance, 8.4 million people severely food insecure, and a further 10 million that could fall under the same category by the end of the year, if action is not urgently taken.“It is bleak”, UN humanitarian chief Mark Lowcock told the Security Council on Friday. “We are losing the fight against famine”. In addition, more than 1.1 million cases of acute watery diarrhoea or cholera have been reported since April 2017. 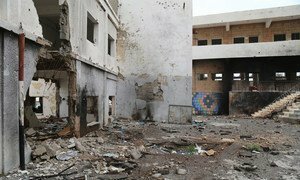 Conflict in Yemen – already one of the poorest countries in the world before the crisis – escalated in March 2015, when an international coalition led by Saudi Arabia intervened militarily at the request of the Yemeni President. Airstrikes have become a daily occurrence for millions of civilians. Since 1 June alone, according to the UN Office for the Coordination of Humanitarian Affairs (OCHA), half a million people have been forced to flee their homes in Hudaydah, an opposition-held governorate in western Yemen, bringing the total of internally displaced persons in the country to 2 million. Hundreds of thousands of families no longer have a regular source of income – including teachers, health workers, water and sanitation workers and other public servants. They have not been paid a regular salary in two years. Currently, over 150 relief organisations, including eight UN agencies, are working around the clock to provide food, shelter, nutritional assistance, protection services and much more to millions of Yemenis whose lives have been uprooted by the conflict. Of the nearly US$ 3 billion required for this year’s response plan, $2 billion (65 per cent) have been mobilized, making it the world’s best funded humanitarian appeal. The humanitarian response reaches more than 7 million people every month across Yemen and the number of people reached has increased consistently across sectors during the year. However, the needs continue to outpace the response capacity and humanitarian workers face critical challenges every day. According to OCHA, the organizer of the General Assembly high level event, these include impediments to humanitarian action such as movement restrictions, attempted interference and harassment, as well as fluctuating commercial import levels and collapsing basic health, education, water and sanitation services. The event will take place from 1:15 pm to 2:30 pm at UN Headquarters and will be broadcast live on webtv.un.org. It will include opening remarks by the UN head of humanitarian affairs, Mr. Lowcock, and a briefing by Yemen’s Resident and Humanitarian Coordinator for the UN, Lise Grande. Raising the alarm over the rapidly deteriorating humanitarian situation in Yemen, the top United Nations relief official on Friday underscored the need for all parties to avoid further military activity around Hudaydah port – the vital lifeline through which food and fuel flows into the war-torn country. 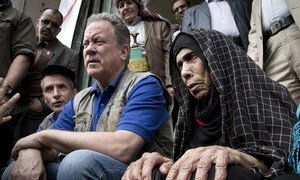 As conflict continues to rage in Yemen, leading to widespread economic hardship and a rampant inflation, the World Food Programme (WFP) is sounding the alarm over soaring food prices that are affecting millions of Yemenis.